Mayor John Compton called the regular meeting of the Town Council to order at 8:20 p.m. In attendance were Councilors Darrell Anderson (via telephone), Charlie Challstrom, Rob Gilmore, Marida Hines, Patty Klein, and Audrey Maskery. Also in attendance were Historic Preservation Commission Chair Bob Booher, Treasurer Mary Challstrom, Georgette Cole, Joan Mahaffey, Bud & Carolyn O’Connor, Jane Seegal, and Nick Suzich. Charlie Challstrom moved to approve the agenda. Audrey Maskery seconded the motion. Rob Gilmore asked to add “Naming the Dog Park” after the Treasurer’s Report. The discussion of Ordinance 2019-03 was moved to the 12th position on the agenda. Vote: 6-0, approved as amended. There were no public appearances. Charlie Challstrom moved to approve the February 11, 2019 Town Council Meeting minutes. Audrey Maskery seconded the motion. A number of minor amendments were proposed. Vote: 5-0 (Anderson, Challstrom, Gilmore, Hines, Maskery). Patty Klein, absent in February, abstained. Approved. Patty Klein moved acceptance of the Treasurer’s Report for February 2019. Marida Hines seconded the motion. Vote: 6-0, accepted. Mary Challstrom reminded everyone about the March 26th Budget Work Session. Rob Gilmore reported the Dog Park Committee wanted to give the Dog Park a name. Based on a survey among members, the name “The Dog Spot” was proposed. Mary Warfield and Rob Gilmore will bring a resolution to name the dog park to the Council next month. Charlie Challstrom moved to enact Ordinance 2019-01; Ordinance Adopting Amendments to the Washington Grove Zoning Ordinance to Delete Definitions for Repair and Ordinary Repairs and add a Definition Of Ordinary Maintenance and Repairs. Input from the Public Hearing was noted. There was no further discussion. Rob Gilmore seconded the motion. Vote: 6-0, Ordinance approved. Charlie Challstrom moved to enact Ordinance 2019-02; Ordinance Adopting Amendments to the Washington Grove Code of Ordinances Article IV Building Permit Regulations to Modify Requirements for Building Permits. Marida Hines seconded the motion. Input from the Public Hearing was noted. There was no further discussion. Vote: 6-0, Ordinance approved. Meat will be donated to food banks, food pantries, or soup kitchens to feed the hungry. Vote: 6-0, as Introduced as amended. Actions: Patty Klein will get answers to questions about archer’s kill-rate and what to do if a deer is not completely dead and it goes into the Conservation Meadow. Mayor Compton reported feedback about the speed hump installed on Grove Road indicates the hump is effective in slowing people down. Most reports indicate residents dislike the humps but like the results and are willing to live with them. It was suggested the Town consider using this new type of hump instead of the replacement asphalt hump scheduled for rebuild on Ridge Road in the current proposed road work. Darrell will discuss this with the contractor. The Mayor and Council also talked about the trial bumps on Chestnut Road and perhaps adding additional new-style humps on that road as well. The Town received three (3) competitive responses to the request for proposal for leaf collection. Pat Klein moved to accept the proposal from Green Earth. Rob Gilmore seconded the motion. After a brief discussion about performance and clean up, it was decided to include some language about expectations for improvement of previous insufficiencies in the acceptance letter to Green Earth. Vote: 5-0 (Anderson, Challstrom, Gilmore, Hines, Klein). Audrey Maskery abstained. Mayor Compton thanked Nick Suzich and The Board for their work. The Mayor and Council discussed the procedures submitted by the BOES. Questions were raised about how non-qualified voters, misplaced absentee ballots and ballot security would be handled. The idea of putting the Town embossed seal on every ballot was favorably received. Marketability of a home with a covenant as proposed providing for reversion of ownership of the land to the Town. Striking the reversion provision in E.4. Exploring modification of Section E.4 to include a requirement for the Town to follow a process before pursuing reversion of the land sale. A proposal from the Planning Commission to combine sections E.2 and E.3 and use more accurate language about lot line adjustment. Adding, as a new Whereas, a clear explanation that the Town’s retained interest in the land is solely intended to provide protection from renovations affecting the historic integrity of structure on the pieces of land being sold. Further inquiry from title companies how title insurance is affected by a reversion covenant. Actions: Mayor Compton will further consult with the Town Attorney on process and reversion of ownership for a land sale transferring “a defeasible fee simple interest in the property”. The Council will revisit this ordinance at the April Council meeting. Charlie Challstrom moved to approve the Council Reports and post them on the website. Patty Klein noted the EPSC proposal that removable bollards replace the gate on Brown Street at Hickory Road, and EPSC concern over the safety of the walkway on the north side of the Post Office building in the Commercial Corner. Mayor Compton was requested to write a letter to Montgomery County Code Enforcement concerning handicapped access to this property with a specific need for a railing. Charlie Challstrom noted PC interest in addressing the use of dumpsters in Town, and discussion of the Public Ways & Property Permit to provide for repair of Town land disturbed by construction. Mayor Compton announced the Board of Zoning Appeals approved the special exception use of 105 Washington Grove Lane as a church for Movimiento Pentecostal Rios de Agua Viva, Inc. at a hearing on February 23, 2019. He agreed with Board Chair Marc Hansen’s opinion that the Town’s ordinances limiting uses at the Commercial Corner were aimed almost exclusively at protecting adjacent residences and roads from undue impacts of use, and not towards protecting other tenants. Tenant protections are in the building codes of the County the Town incorporates by reference, and in their lease terms with the landlord. Mayor Compton reminded members of the March 26th budget work session. He stated salary decisions will take place then. There being no further business, the meeting was adjourned at 10:27 p.m. Meetings: The regular monthly meeting was held on February 19, 2019. The next regularly-scheduled meeting will be held March 19, 2019. Reviews and Discussions: Bud O’Connor (409 5th Avenue) attended to update his presentation to the HPC in January and to report that he has submitted presented a slide presentation of his past reconstruction for applied to purchase Town Land as per Zoning Ordinances 2018-04 and 2018-05 in January. He restated his objections to the previously issued “Exhibit C” prepared by HPC; the HPC agreed to review “Exhibit C” for 409 5th Avenue at the March HPC meeting. The HPC received a submission from the resident at 3 Ridge Road for exterior modifications, which include new tapered columns on the existing stone column bases on the front porch facing Ridge Road; the addition of screen panels and wrap 4×4 posts with 1xtrim at existing side-covered porch. Screen doors will be added for access; the side screen porch does not extend beyond the front house wall. The HPC will complete a written review. Progress on contract for review of the Town’s Historic District Updating: The HPC will receive the Draft NR Nomination from Robinson & Associates on March 1st and will have one week to review prior to submission of Draft to MHT. The goal is to confirm that the Draft NR Nomination is as HPC envisions it based on previous reviews. In addition, text on the Commercial Corner and Lighting will be drafted and included in the comments to Robinson & Associates. Master Plan: The HPC will review Section 5 (Recreation and Parks) and Section 6 (Environmental Concerns) at the March meeting and submit comments before the next public Master Plan work session. HPC Budget for FY2020: The HPC reviewed the FY2019 Budget, led by Marilynn Frey and noted what funds remained for HPC initiatives this year. A discussion of what items to include in the FY2020 Budget highlighted areas to submit requests to the Town by March 26. A final review will be held at the March HPC meeting. Susan Van Nostrand continues to hold gatherings to produce more of the signs for this project. Another 16 signs were completed and were turned in to the office for Steve to pick up and install. This project is coming to an end this spring. Repaving: Work will begin when the weather cooperates. Speed Hump Trial: One Superior Speed Hump was installed on Grove Road, with appropriate signage. Street Lights: The Washington Grove ad hoc Lighting Committee met in February. A Dropbox account was started to collect documents collected or created by members. In addition, a discussion of potential budget requests for FY2020 began. The Committee reviewed documents provided by members; discussed possible field trips to neighboring communities with LED streetlights; and, began updating the Lighting Section in the 2009 Master Plan. No report this month. I have contacted M-NCPPC to discuss their plans for the spring. Sale of Town Land to Jane Seegal: The Planning Commission has reviewed Ordinance 2019-03 proposed and introduced to authorize sale of the two parcels of Town land on which portions of the home at 315 Grove Avenue are constructed. The PC has previously determined: 1) the sale of the two parcels of Town-owned land will not create an additional building lot, and 2) public ownership of the two parcels of Town-owned land does not serve any present or foreseeable public use or function. The PC also previously determined sufficient information has been submitted to document the dimensions and the current degree of non compliance as may be required for a future building permit application for these portions. The PC has noted apparent inconsistency in the initial wording of items E.2. and E.3. of the Ordinance as introduced, and has recommended corrective wording for Council consideration along with enactment of Ordinance 2019-03. Master Plan Update: The 2019 Master Plan Working Draft on the Town website has been updated to reflect the PC Master Plan Worksession held on February 13, 2019, with proposed changes up through Section 3.7. Work continues for Section 1.1 (Residential Zones) and Section 1.3 (Other Town Owned Land). Discussion of the use of gravel and/or grass on the walkways included implications for emergency access. Former Section 3.2 (Lighting) is being moved to Section 4 (Community Facilities), and suggestions for this section will be shared with the new Lighting Committee for their review and recommendations. Section 3.4 (Walkway/Bikeway Connection) is updated with recommendations from the Bike Path Committee. The next PC work session is scheduled for March 20, 7:30 p.m., and intended to start with Section 2.3 (Boundary Enhancements) recommendations from the Border Committee. Kitchen Cabinets, Flooring, and Restrooms: The kitchen cabinets and flooring are being replaced this month by Town Maintenance. The same flooring material is being considered for installation in the restrooms and the hallway. If time and workloads allow, there are also plans this month to replace all the linoleum on the walls of the restrooms with beadboard, plus protective wall covering where needed. Termite Treatment: Now that foundation repairs are complete, including installation of steel floor beams/columns and removal of wooden footers, the soil under the Main Hall will no longer be disturbed. The follow-on pest control treatment will target subterranean termites. McCathran Hall Cleaning: McCathran Hall cleaning continues in cooperation with SEEC, an organization providing developmental assignments. Mayor Compton authorized extending this hall cleaning job trial period for another 3 months. The “Janitorial Services for McCathran Hall” task summary was updated to reflect modified floor treatment methods for the wood floors. Ongoing performance evaluation and feedback are an important aspect of this cleaning program. McCathran Hall Lighting Upgrades: Most of the halogen and compact florescent light bulbs have been replaced with LED bulbs. Those remaining to be converted are the dimmable bulbs in the Main Hall overhead tracks, and the four hardwired bulbs over the Council Room table. While saving significant energy, this conversion to LED bulbs should also greatly reduce the difficult task of replacing flood lights in the Main Hall ceiling cans. As reported above, the contract for the Dog Park was finalized, signed, and sent to Tri-County. I contacted Tri-County’s references and confirmed their favorable views of Tri-County, which I then reported to the Mayor, Town Clerk, and Town Council. The Town Clerk and I finalized the contract, which Mayor Compton signed, and which has been sent to Tri-County for its countersignature. The Woods Committee met on March 4, 2019. There was a brief review of the current fiscal year budget expenses and remaining funds to continue to address ongoing invasive plant control, mitigation for downed or other trees on/near trails in the woods that pose public safety concerns, and various community outreach activities to include clean-up activities in the woods. The proposed FY2020 committee budget for a total of $47 K was submitted to the Town Treasurer. This is $6 K less than FY2019 and reflects adjustments in an anticipated decrease in projected funding for invasive plant control. The majority of the meeting was focused on deer population management plans. Several committee members participated in introductory meetings with State DNR/MC Parks Deer Program qualified volunteer archery teams that are available to assist the Town in deer population control. One of the teams exceeds the State/MC Parks qualifications in credentials and experience, and are locally based firefighters. The committee prepared a draft amendment to the current Town ordinance prohibiting hunting and requested the Mayor to send to our town attorney for review. The Town attorney is in the process of reviewing and will advise accordingly. It is anticipated that the amended ordinance could be introduced at the March TC meeting. Several committee members are preparing a proposal for erecting a deer exclosure in the East Woods to protect a selected sensitive area to promote recovery of understory and canopy damaged by deer over-browsing. Several potential sites have been visited pending further committee discussions. The committee emphasized the importance of developing certain metrics to document outcomes and success of all deer management activities. The WC will coordinate with the Lake Committee to hold a joint Spring Clean-up in the West Woods. Tentative date is Saturday, April 27, 2019. The Emergency Preparedness Committee met on February 28, 2019. The committee acknowledged the inclusion of its role in advising on town safety and incorporated by consensus the word “Safety” into its name as the “Emergency Preparedness and Safety Committee (EPSC)”. The committee also welcomed a new member and town resident, Dave Lutter. The committee has provided it suggested additions of a new section on emergency preparedness for the Master Plan update. They also discussed finalizing a draft document “Town of Washington Grove Risk Management and Safety Procedures” compiled using material from the Local Government Insurance Trust to be presented to the Town Council for approval and adoption. The visual and noise barrier for the new Town Hall generator remains to be installed, and Pepco’s electrical connection for the 200-amp upgrade is expected within about 2 months. Several ongoing safety issues need to be addressed by the Town. (1) There has not been any recent County DOT activity to lower the Railroad Street drainage pipe and reduce the standing water hazard. The EPSC recommends contacting County DOT regarding this situation after formal adoption of the pending County Hazard Mitigation Plan; (2) Town road intersections should be revisited in the Spring to continue identifying situations where vegetation obstructs vision and impairs traffic safety; (3) EPSC to compile examples of house number signs to display at the Annual Town Meeting in May. EPSC Recommendations to the Town Council: (1) On-site discussions with County DOT regarding pedestrian and traffic safety strategies to follow up the report from County DOT Engineer Mark Terry. For traffic approaching the Deer Park Bridge from both sides, EPSC recommends replacement or repainting of hold back lines to increase visibility; (2) On the East Deer Park Drive side, suggestion to move or augment the sensor coil in the pavement that triggers the traffic signal, noting there are occurrences when a vehicle stops too far from the bridge to trip the signal; (3) recommends a left turn prohibition for traffic on Railroad Street approaching Chestnut Road from the “hump” due to limited visibility and the danger of rear-end collision; (4) reiterates the recommendation to augment the Railroad Street crosswalk with a speed table to be aligned with the MARC train/RideOn bus location where the new streetlight installation is also expected to improve pedestrian visibility; (5) recommendation that Town maintenance be consulted to determine if removable bollards are practical to replace the Brown Street red gate near Hickory Street with either key or combination locks to allow emergency vehicle access. The current handrail height is consistent with some County safety regulations. The walkway alongside the Post Office was included in a Commercial Corner site plan approved by the Town many years ago. The committee considers the presence of a handrail to be a public safety issue for our Town residents and others using that walkway. Therefore, the EPSC recommends that Mayor Compton contact the County (via a letter or 311) to request an inspection of the existing handrail and walkway situation, and that the County contact the Commercial Corner property owner to ensure that public safety measures and code compliance are addressed. The next EPSC meeting is scheduled on March 28, 2019. Recent gypsy moth egg survey by the Maryland department of Agriculture Forest Pest Management, report no new egg masses were observed in the town at the survey locations. Apparently the very wet spring in 2018 could account for the low egg mass, hopefully this will continue due to the rather wet 2019 spring. The next Forestry and Beautification meeting will be on Wednesday March 13 in the Council Room at 7:30pm. We will be working on plans for spring tree planting. Refurbished old Ford tractor: pressure-washed, dismantled engine cover, re-painted the tractor, and re-assembled tractor. Steering column broke on Town truck, repaired and re-installed steering column. Plowed and sanded the Town streets: cleared sidewalk along Washington Grove Lane during storms using new (Steve manufactured) snow plow. Cut fallen tree branches, clear all storm detritus from roads/avenues and taken to dump. Pulled out fence posts on Town property at 115 Washington Grove Lane, this action was requested by the Town Council. Install new speed bump on Grove Road. Installed refurbished street signs – took down more signs to be refurbished and repaired at 4th Avenue, Center, Hickory/Oak and Maple Road. Work started to refurbish the kitchen area in the Old Council Room; replacing all kitchen cabinets, countertop, and flooring. As I have previously reported, the Maryland Municipal League (MML) Legislative Committee’s sole 2019 priority is the ability of local authority over the installation and location of small cell towers. This is the 5-G “Small Cells” tower installation with goals towards preservation of local authority to site small cellular infrastructure including the ability of a municipality to issue right-of-way access and aesthetics to communities. Actions by the Federal Communication Committee adopted regulations which preempts local governments’ authority in restricting the rights of municipalities for cell tower installation. The installation of such towers is likely to happen on existing telephone poles. 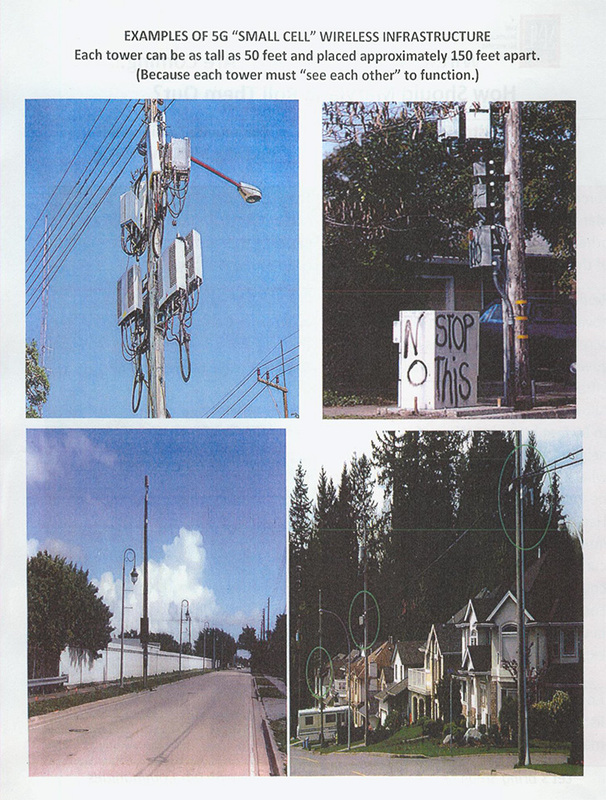 According to MML, a survey was sent to town clerks state-wide asking about ordinances for cell towers. Hopefully Washington Grove responded to this survey. MML reported 90% of towns involved with MML has enacted ordinances regarding installation of cell towers. MML – Wireless 5G “Small Cells” Are Coming… How Should Maryland Roll Them Out?